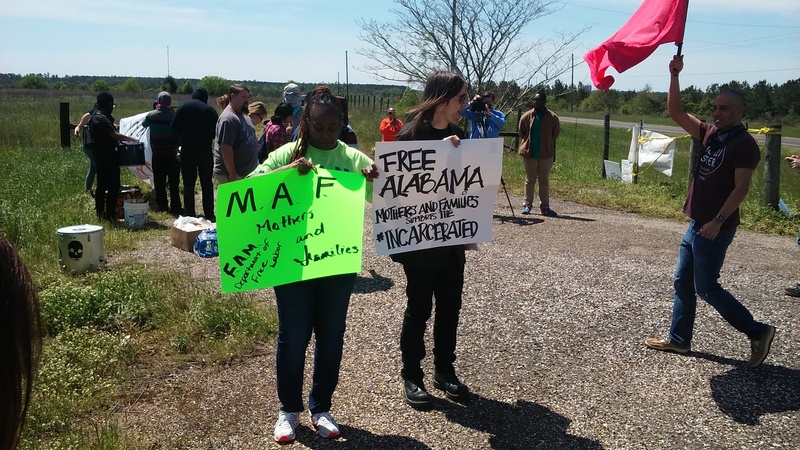 On Saturday, April 9th, more than thirty people answered the call put forth by Freedom Alabama Movement (F.A.M.) 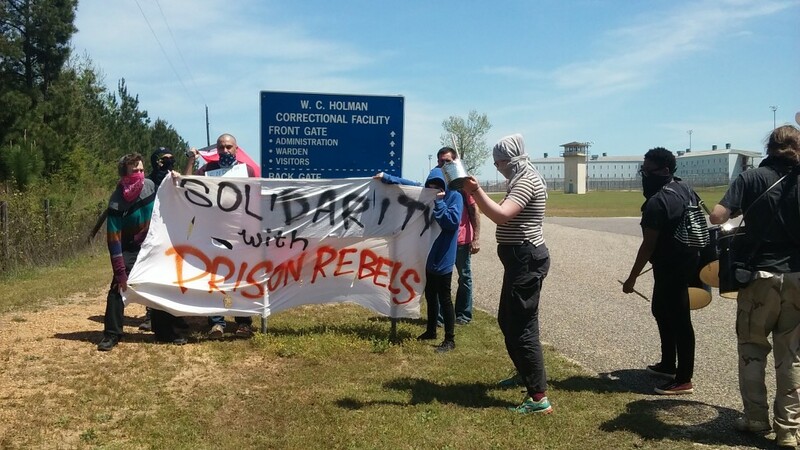 for a demonstration outside of the decrepit Holman Prison in Atmore, AL. About four weeks ago, Holman was the site of a large uprising involving hundreds of inmates, who barricaded their dorms, fought guards, set control rooms on fire and even stabbed a guard and warden. This is the third consecutive Saturday where demonstrations have taken place outside of the tumultuous rural correctional facility, and by far the largest to date. The demonstrators gathered to carry the prisoners’ message further and also express our solidarity and our mutual desire to destroy the miserable society that holds them—and to a lesser degree, us—captive. Family members of the incarcerated, anarchists, communists, activists and locals who lived nearby were all present. 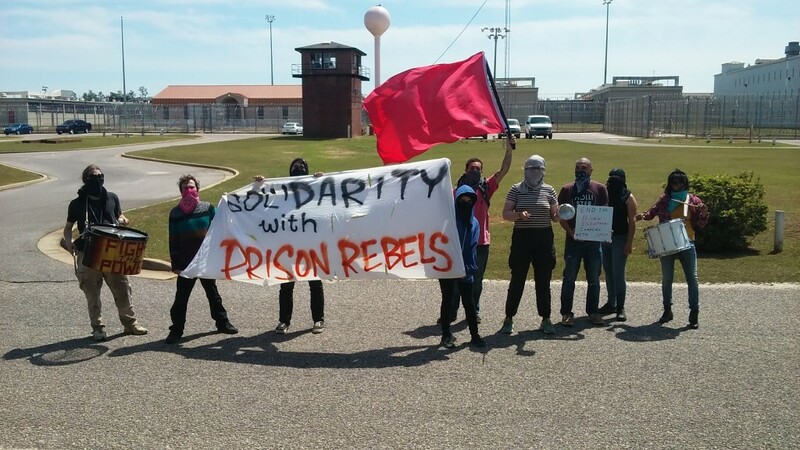 Initially less than a dozen demonstrators attempted to hold banners directly outside of the prison and play drums, but were quickly met by Corrections Officers in tactical gear (Camouflage uniforms, body armor, etc) who angrily instructed them to move off the “private road” and to the “free speech zone” located at the highway. The small contingent retreated and reassembled with an additional twenty demonstrators who had just arrived. Stories and plans for future actions were shared, and short interviews were given to a news dude from Montgomery. 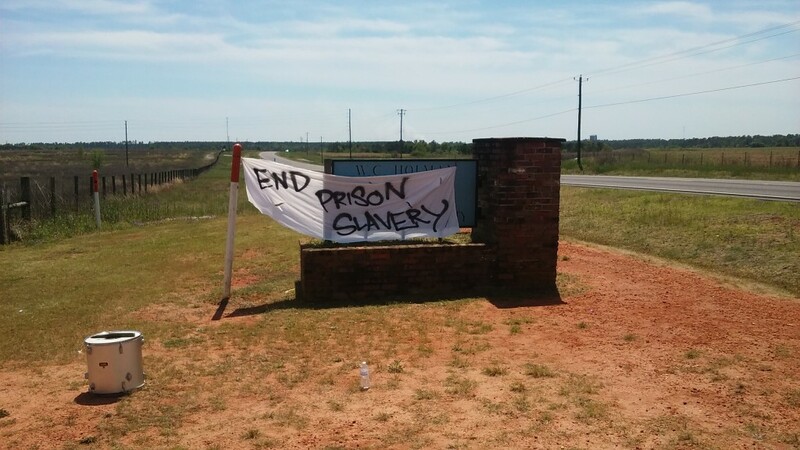 A banner saying “END PRISON SLAVERY” was rigged over the Holman Prison Sign. 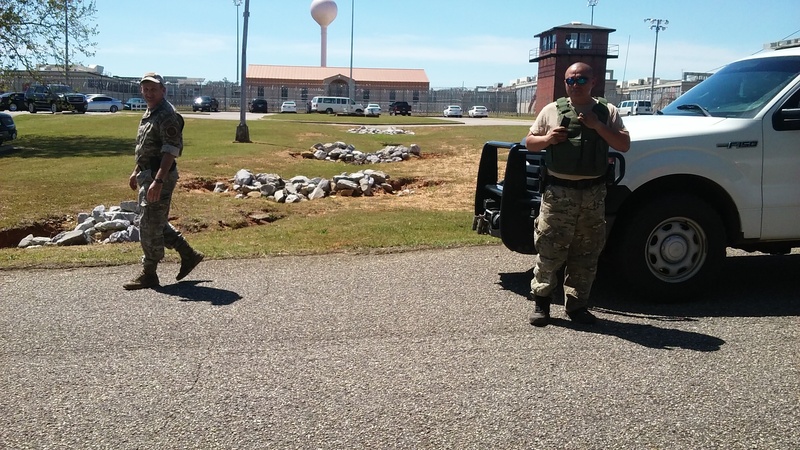 After sitting around for about an hour, demonstrators decided to defy the orders given by the corrections officers and proceeded to march down the long dirt road back to the prison. DOC Trucks and Vans kept driving past and guards would scream for the demonstrators to turn around, but they were just ignored, laughed at, given middle fingers, chanted at, etc. Upon arriving for the second time, a banner reading “SOLIDARITY WITH PRISON REBELS” was unfurled and people began bashing on their drums. Prisoners inside report being able to hear the disturbance outside. There were no more interactions with corrections staff or local police, which many thought meant they were either bluffing about it being a private road or just didn’t have the capacity to enforce any of their demands and threats upon the small crowd.